Who can use this Building Contract? A home owner, self-builder or developer. What is this building contract for? While it was designed for use by someone wanting to build a new house, the format and wording allow the contract to be used more widely, including a custom build project, an extension, an office or some other building. This building contract can be used to appoint more than one contractor on a project, using essentially the same terms and conditions. Or you can use this building contract for the main contractor and our short Trade Contract B153 for different trades with smaller portions of the work. What are the main issues for a self-builder when preparing a Building Contract? What detailed terms does the building contract contain? ContractStore supplies templates and is not a law firm. But all our templates are written by experienced lawyers, in this case by a construction lawyer. So, we can arrange legal assistance for customers who need special terms in one of our documents or a bespoke template. . For more information see our Legal Services page. 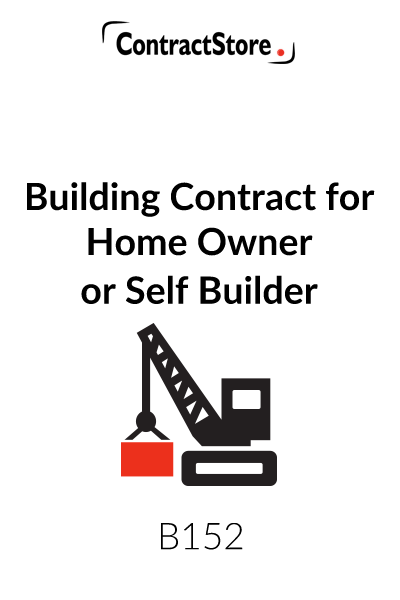 This contract is designed for use by home owner or developer who is appointing a contractor to build a new house or small development or carry out other construction work. 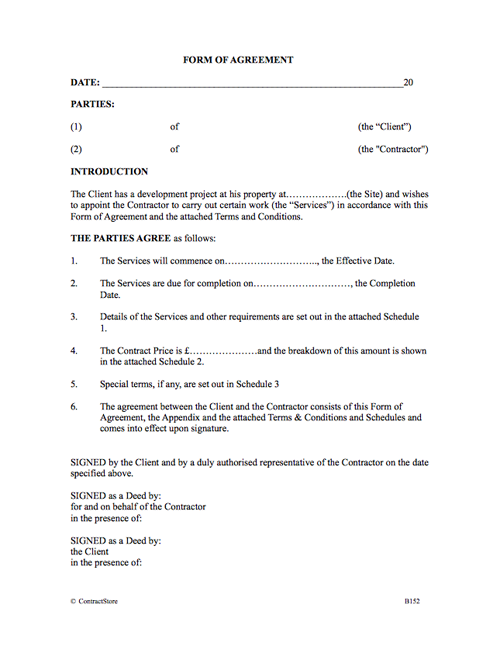 The contract is structured in a user-friendly style in four parts: a one page form of agreement that the client and contractor will sign, a set of (standard) Terms & Conditions, a one-page Appendix with a list of specific items such as the completion date, amount of insurances etc., and Schedules that should contain details of the project including the scope of work/ specification, the contract price and payment terms. 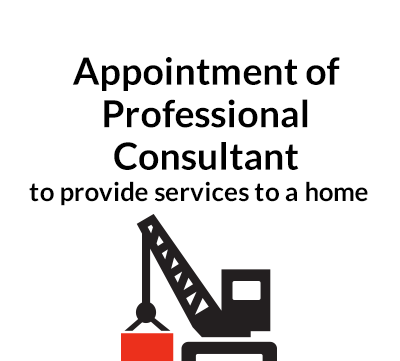 The form can be used either when appointing one contractor for a building project or when the client decides to engage more than one contractor. 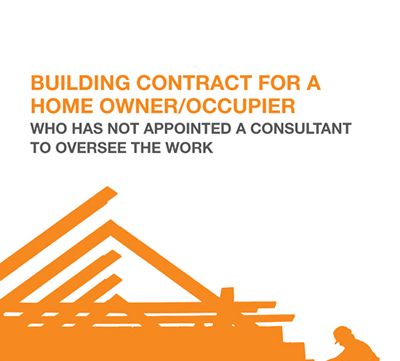 For general guidance on issues that need to be considered in the contracts for a building project, see our free document Guidance Notes for a Home Builder. This is reasonably self-explanatory and you need to fill in the relevant details here and in the Appendix before it is signed. Clauses 1 and 2 set out the general obligations of the contractor and the client. Clause 3.1 and 3.3 deal with responsibility for getting planning and other consents, and you should discuss this with your architect or builder. Clause 3.2 refers to warranty insurance: it is sensible for a self-builder to arrange a 10 year warranty insurance to cover against the risk of structural problems occurring after the building is completed. Self-Build Zone https://www.selfbuildzone.com has information on warranties. Clause 3.4 refers to the CDM Regulations: these deal with health and safety issues and apply to construction projects in the UK. Since 2015 it has been a requirement that on domestic as well as commercial projects, the client has a principal designer and a principal contractor. The principal designer will normally be the architect and the principal contractor will normally be the main contractor working on the site. The principal designer’s role will be to plan, manage, monitor and coordinate health and safety in the preconstruction phase of a project. The principal contractor coordinates the work of the construction phase of a project, so that it is carried out in a way that secures health and safety. Clause 4 allows for the client’s architect or other representative to manage the project and issue instructions etc. on his behalf. There is also reference to the contractor’s representative and the need for him to be based at the site when needed during the work. Clause 5 sets out the basic rules for working on site and the contractor’s responsibilities. Clause 6 deals with price and payment. More details of price and payment will be in Schedule 2 but the basic arrangement provides for the contractor to submit regular applications for payment to the client – either monthly or in accordance with a payment schedule – and the client will pay within 30 days. If the client is not happy with an application, the client needs to give notice with reasons before the payment date under clause 6.4. Clause 7 deals with change and delay. It is important to have a procedure for dealing with changes during a building project and this is set out here. Before implementing a change, the impact in terms of price and timing need to be assessed and, once agreed, the change should be confirmed in writing. We have a Change Confirmation Form that can be used for this: document B155. If the contractor is delayed for reasons beyond his control the contract allows for him to get an extension of time, and the completion date will then be adjusted. Delay may also entitle the contractor to extra money but we have inserted some wording in clause 7.8 that will restrict that entitlement. Clause 8 makes it clear that bad work needs to be corrected by the contractor. Clause 9 deals with completion and post-completion defects. Once the work has been satisfactorily completed, the client or his representative will sign a completion certificate. There is then a 6 or 12 month Defects Period during which the contractor has to remedy any defects that appear in the work. Clause 9.5 provides for liquidated damages which you may want to incorporate. Liquidated damages are a fixed daily or weekly amount that the contractor will have to pay if he does not meet the completion date. The damages should be a reasonable pre-estimate of the cost that the client will incur. For example, if you are building a new house and you have to rent another property until you can move in, the liquidated damages might be equal to the rent that continues to be paid if completion doesn’t take place on time. Clause 10 refers to insurance and the details of insurance to be taken out by the client and the contractor will be inserted in the Appendix. Clause 10.3 is a wide indemnity in favour of the client from the contractor making the contractor liable for problems caused by his negligence etc. In clause 11, materials coming onto the site will become the property of the client, and if they are paid for in advance, then ownership will pass to the client at that stage. Clause 12 allows either party to terminate the agreement if the other commits some serious breach of contract or becomes insolvent. Clause 12.5 gives the client the right to terminate at any time but if that happens, he has to pay some compensation to the contractor. Clause 12.7 deals with suspension. This might be needed if, for example, the contractor is appointed but then some planning decision holds up the project. Clause 13 is designed to ensure that any guarantees that come with equipment supplied by the contractor will pass to the client so that the client can contact the manufacturer direct if something goes wrong. If you are borrowing from a bank or financial institution to fund the project, the lender might require a direct agreement from the contractor and this is covered under 14.2. Clause 15 contains a number of “boilerplate” lawyers’ clauses. Clause 16 deals with disputes and there is a three stage process: firstly, negotiation and, if this does not work, then either party can ask for adjudication which is in fairly short process and avoids more expensive and lengthy court proceedings. If adjudication does not resolve the matter, then the dispute will have to be referred to the court. We have also allowed for the possibility of mediation in clause 16.4. This can be quicker and cheaper than adjudication and involves the parties trying to reach a negotiated settlement with the help of an independent mediator facilitating the discussion. Among mediation organisations are Mediation for Construction which has a fixed price arrangement and CEDR (Centre for Effective Dispute Resolution). This needs to be completed before the contract is signed and is hopefully self-explanatory. This will contain details of the project and the description of works will refer to drawings and specifications which contain the detailed scope of work. The more detailed the design and specification before work starts, the less scope there is going to be for uncertainty and the need for changes which, of course, will have an impact both with regard to price and programme. The contract price should be inserted here together with a breakdown of at least the major elements. If there are ‘provisional sums’ included – i.e. prices for work or equipment that has not yet been finally decided, such as kitchen or bathroom – these should also be mentioned. There are two options for payment – either monthly or by reference to a payment schedule. You should delete whichever option does not apply. In the case of a payment schedule, you need to be clear in the wording so that there is no argument as to whether or not a particular milestone has been reached that entitles the contractor to payment.